The Sudanese government has very cleverly applied to the United States for a visa so that President Bashir can attend the upcoming session of the United Nations General Assembly. This move highlights the problems with the position that the Court has taken respecting the existence of immunities. As head of State of a United Nations Member State, it is axiomatic that Bashir is entitled to participate in the United Nations General Assembly. Under the Charter of the United Nations, (Article 105 (2)): ‘Representatives of the Members of the United Nations and officials of the Organization shall similarly enjoy such privileges and immunities as are necessary for the independent exercise of their functions in connexion with the Organization.’ The Charter takes precedence over the Rome Statute of the International Criminal Court. The headquarters agreement between the United States and the United Nations requires that travel be facilitated to United Nations headquarters. This too is beyond dispute. Dr Dapo Akande of Oxford University has very fully and eloquently set out the situation in a blogpost on Ejil Talk. In sum, the US is bound allow Bashir to attend the GA session and not to arrest him. Quite rightly too. The obligations in question are rather limited, they are temporary and are of great importance for the ability of the UN to function without interference. Thus, they are ultimately of great importance for the maintenance of a system of peaceful relations among states. Participation by states in the UN is part of the very essence of the UN system. Allowing encroachment of that right would set a damaging precedent for the system. Enforcement of ICC arrest warrants is not ultimately dependent on what happens with respect to UN summits. Almost two years ago, the Pre-TrialChamber of the Court took a very extreme position, holding that Bashir had no immunity at all as a consequence of article 27 of the Rome Statute. If the Court seeks to exercise its jurisdiction over a person who is alleged to be criminally responsible for a crime within the jurisdiction of the Court and if, in the circumstances, such person enjoys, according to the Convention on the Privileges and Immunities of the United Nations and the relevant rules of international law, any privileges and immunities as are necessary for the independent exercise of his or her work for the United Nations, the United Nations undertakes to cooperate fully with the Court and to take all necessary measures to allow the Court to exercise its jurisdiction, in particular by waiving any such privileges and immunities in accordance with the Convention on the Privileges and Immunities of the United Nations and the relevant rules of international law. But if there is no immunity as a result of article 27, what is there to waive? Belgium had made the argument when the Relationship Agreement was being drafted, but the United Nations Secretariat didn’t agree. Thus, the Court acknowledged that immunities exist, and that article 27 does not provide a full answer when someone is charged before the Court. It is a curious conclusion because it seems as if the Pre-Trial Chamber is actually encouraging the United States to issue the visa to Bashir. It would have been interesting to have some discussion of the relevance of this injunction to the Court that it ‘may not proceed with a request for surrender or assistance which would require the requested State to act inconsistently with its obligations under international law with respect to the State or diplomatic immunity of a person or property of a third State’. Perhaps someone could explain why article 98(1) doesn’t apply here. Probably if the proceedings before the Pre-Trial Chamber were genuinely adversarial this issue might have been addressed. This is a rather common problem when important precedents are set in ex parte proceedings before the Court. Some pundits have been suggesting that immunity is trumped because Bashir has been charged with genocide. The magic of jus cogens is supposed to blow away arguments based on various international agreements and even the Charter of the United Nations. In this respect, it is worth recalling the words of the International Court of Justice in a very recent case, where the ‘logical problem’ of maintaining that immunity evaporated because serious crimes are charged was addressed. The Court was speaking of State immunity, but the reasoning applies to individuals too. It noted that if ‘the mere allegation that the State had committed such wrongful acts were to be sufficient to deprive the State of its entitlement to immunity, immunity could, in effect be negated simply by skillful construction of the claim’ (Jurisdictional Immunities of the State, para. 82). Isn't that what is happening here? Can it really be the case, as some contend, that the legal position of Sudan and Bashir has been drastically altered merely because a Pre-Trial Chamber of the Court ruled that there were ‘reasonable grounds’ to allow the Prosecutor to pursue a charge of genocide (after initially concluding that there were not even reasonable grounds and then being 'corrected' by the Appeals Chamber which said it had set too demanding a standard)? Dr Akande’s comment, cited above, about the importance of full participation in the United Nations system is extremely helpful. However frustrating the international law on immunities may seem because of its impact on accountability, immunities also fulfill a very important purpose in encouraging international peace and security. Obstructing Bashir's visit to New York is not without consequences over the long term. The same reasoning also applies to ad hoc peace negotiations like, for example, what is now being proposed in Geneva with respect to Syria. Is there not a profoundly important value to the international system in having a rule that facilitates negotiations between heads of State and similar officials, whatever we may think of them? Suppose the principle were to be established that a head of State was not immune from arrest pursuant to a warrant of the International Criminal Court when attending the United Nations General Assembly. Probably many governments would then question the safety of traveling to New York. After all, the Court – and other international criminal tribunals – can issue arrest warrants secretly. Traps would be set. The world would not be better off if the General Assembly ceased being a secure, privileged forum with its sacred mission of promoting international peace. Kathleen Cavanaugh, Brian Farrell, John Jackson and myself. Yesterday, Brian Farrell successfully defended his doctoral thesis entitled 'Habeas Corpus in International Law' at the Irish Centre for Human Rights of the National University of Ireland Galway. 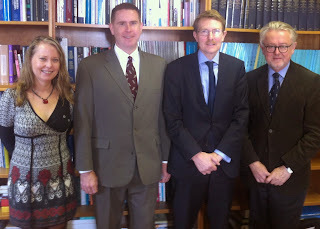 Prof. John Jackson of the University of Nottingham was the external examiner, and I was the international examiner. The award of the degree was recommended without corrections. Brian's research was supervised by Dr. Kathleen Cavanaugh. Bravo, Brian! The Secretary-General of the United Nations stated that President Assad of Syria ‘has committed many crimes against humanity’. See it for yourself on You-tube. This is a very unusual and perhaps unprecedented occurrence. It raises questions about the presumption of innocence given the possibility that the United Nations Security Council could refer the situation in Syria, and with it the case of Assad, to the International Criminal Council. Before the existence of international criminal justice it may have been appropriate for senior international public officials to condemn individuals in such a manner. There was no possibility of trial at the international level. The issue of the presumption of innocence in judicial proceedings did not arise in any realistic way. Everything has changed in recent years as a result of the development of international criminal justice institutions. Perhaps this means that people like the Secretary-General of the United Nations need to be more prudent in their statements than they might have been a few decades ago. Were Assad ever to be charged before the International Criminal Court, he would have an arguable case that his right to the presumption of innocence – enshrined in article 66 of the Rome Statute – has been breached by Ban Ki-Moon’s statement. In a case with many similarities, the European Court of Human Rights has held that where a senior official in the government condemned an individual of a crime before he or she had been brought to trial, an issue of the presumption of innocence arose. In Allenet de Ribemont v. France, the Court held there had been such a breach, referring to ‘a declaration of the applicant’s guilt which, firstly, encouraged the public to believe him guilty and, secondly, prejudged the assessment of the facts by the competent judicial authority’. It would be preferable for the Secretary-General to say ‘there may be serious grounds to believe Assad has committed crimes against humanity and he should be brought to trial to establish if this is the case’ or something similar. This is a better message in that it signals the gravity of the charges against Assad but at the same time insists upon the integrity of the judicial process. The School of Oriental and African Studies is hosting a conference in London on the occasion of the seventieth anniversary of the establishment of the United Nations War Crimes Commission. Yesterday, Justice Richard Goldstone delivered the keynote address. Speakers from a range of disciplines, including law, politics and history, are presenting papers on the activities of the Commission whose role in the early development of international criminal law was so important. Richard Goldstone, centre, with Don Ferencz, right, and myself at yesterday's session of the Conference. Information about the conference is available here. 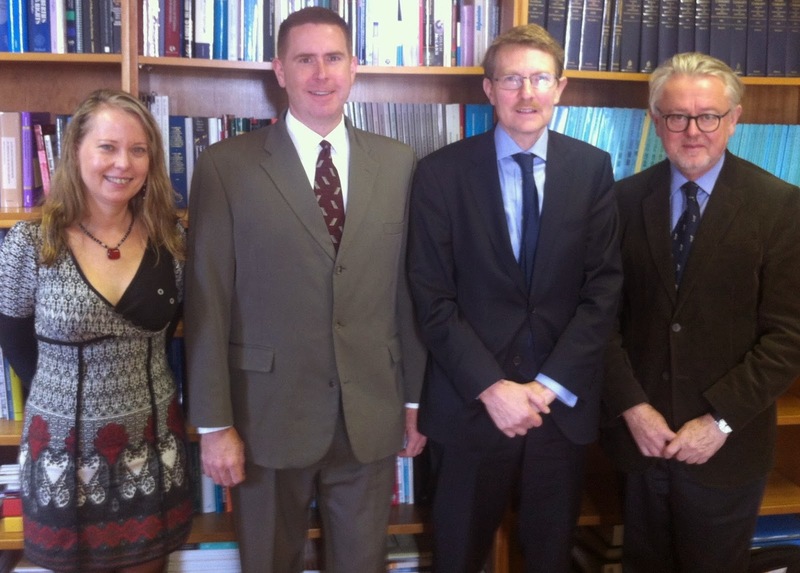 The papers will be published next year in a special issue of the Criminal Law Forum. The main organisers of the conference, Dan Plesch and Shanti Sattler, have managed to secure the opening of the United Nations archives with respect to the Commission. They have their own great website on the Commission. Many of the relevant documents are now available in the legal tools section of the website of the International Criminal Court. The have also produced pdfs of the official history of the Commission, published in 1948. 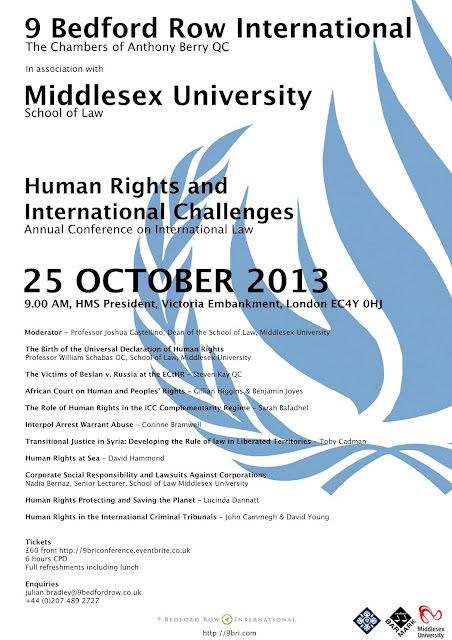 This item is for those who are interested in the history of international human rights law. A few days ago, while researching a talk on the beginnings of international criminal prosecutions during the Second World War in the archives of the London International Assembly, I stumbled upon an early attempt at codifying human rights. Several writers and organisations had prepared draft declarations and these were consulted by the Commission on Human Rights in preparation of the first draft of the Universal Declaration of Human Rights (see UN Doc. E/CN.4/W.16). I was surprised to note that the text of the London International Assembly does not appear to have attracted the attention of the Commission on Human Rights. It is not mentioned in UN Doc. E/CN.4/W.16. Nor have I found any references to it in the scholarly writing on the preparation of the Universal Declaration of Human Rights. The London International Assembly was a civil society organisation with broad representation of government representatives at the highest levels or people close to government as well as public intellectuals and academics that met in London starting in 1941 with the goal of reaching consensus on what the post-war world would look like. One of its commissions studied issues of international criminal law, preparing a draft statute for an international criminal court that was then fed the work of the United Nations War Crimes Commission. At the close of the G20 meeting, eleven states issued a declaration concerning Syria calling for ‘a strong international response to this grave violation of the world’s rules and conscience that will send a clear message that this kind of atrocity can never be repeated’. They are Australia, Canada, France, Italy, Japan, Republic of Korea, Saudi Arabia, Spain, Turkey, the United Kingdom, and the United States. The expression ‘world’s rules’, and the slightly longer formulation ‘world’s rules and conscience’, is intriguing. It seems to suggest international law. But why not then use a term that is familiar? The term did not appear anywhere in the materials on the United Nations website. A search in Google Books turned up many references to ‘world’s rules’, although not in the context of international law. It seems the term is used mainly in religious writings. Are the eleven States suggesting that there is some other normative source relevant to the Syria issue that is different from and independent of international law? Are they proposing the ‘world’s rules’ as a synonym for international law? Or are they suggesting the 'world's rules' as a source of international law that is distinct from the classic list provided in article 38 of the Statute of the International Court of Justice? There are, to be sure, sources of international law that do not appear in article 38. Jus cogens (peremptory norms) would be one such source. The famous Martens clause of the Hague Conventions provides another: ‘the principles of the law of nations, as they result from the usages established among civilized peoples, from the laws of humanity, and the dictates of the public conscience’. There is the reference to ‘elementary considerations of humanity’ by the International Court of Justice in the Corfu Channel Case. And to ‘moral law and to the spirit and aims of the United Nations’ in the Advisory Opinion on Reservations to the Genocide Convention by the International Court of Justice. Some will say that these are all concepts subsumed within customary international law, which is of course part of the list provided by article 38. But customary law is based upon the conduct of States and on expressions of their understanding of law. Concepts like 'considerations of humanity', 'moral law' and 'the laws of humanity' must exist autonomously, regardless of whether States comply with them. Did Cameron Really Say that the UN Charter was the Source of a 'very dangerous doctrine'? “Our strong legal advice is that the there is a responsibility to protect - a case for humanitarian intervention because you are preventing a humanitarian catastrophe,” Mr. Cameron said. 'Strong legal advice'? Really? Maybe Cameron has been reading a Foreign Office legal memorandum from the eighteenth century. I doubt there is a serious international lawyer in the Foreign and Commonwealth Office who could keep a straight face making such an outrageous claim. Note the insistence that the ‘responsibility to protect’ is to be exercised ‘through the United Nations’, and ‘through the Security Council, in accordance with the Charter’. The United Kingdom was part of the consensus at the Summit of Heads of State and Government where this statement was adopted. As for the second part of his statement, the notion that the use of force is only authorized under only two circumstances comes from the Charter of the United Nations. It is not simply a ‘doctrine’. It is international law that binds the United Kingdom. Is Cameron really saying that the Charter of the United Nations is the source of a ‘very dangerous doctrine’? The British government has a history of thinking it can defy international law. Or rather that it can purport to be the global equivalent of Arnold Schwarzenegger, delivering its own brand of frontier justice. International courts have been telling it to behave since the earliest days of international adjudication nearly 200 years ago. The Court can only regard the alleged right of intervention as the manifestation of a policy of force, such as has, in the past, given rise to most serious abuses and such as cannot, whatever be the present defects in international organization, find a place in international law. Intervention is perhaps still less admissible in the particular form it would take here; for, from the nature of things, it would be reserved for the most powerful States, and might easily lead to perverting the administration of international justice itself. These words are as accurate a statement of international law today as they were sixty-four years ago, when the United Kingdom was condemned by the International Court of Justice for violating international law. Last night I attended the screening of No Fire Zone, The Killing Fields of SriLanka, a feature-length film about atrocities attributable to the government of Sri Lanka as it crushed the Tamil Tigers in 2009. It is based on the two documentaries made by director Colum Mcrea for Channel 4 but there is also much new footage and the presentation is quite fresh and different. Check the website of the film for information about how to see it. Residents of the UK can get it for a small price on www.distrify.com. Also, check out the special presentation of the film on Prezi. The film is released as part of a campaign as Sri Lanka prepares to host the Commonwealth Heads of Government Meeting in November. Last night, Colum and Channel 4’s Jon Snow both said they plan to be in Colombo for the meeting. The film concludes by noting the deteriorating human rights situation in Sri Lanka. Only last week, UN High Commissioner for Human Rights Navi Pillay visited the country and said that 'democracy has been undermined and the rule of law eroded'. 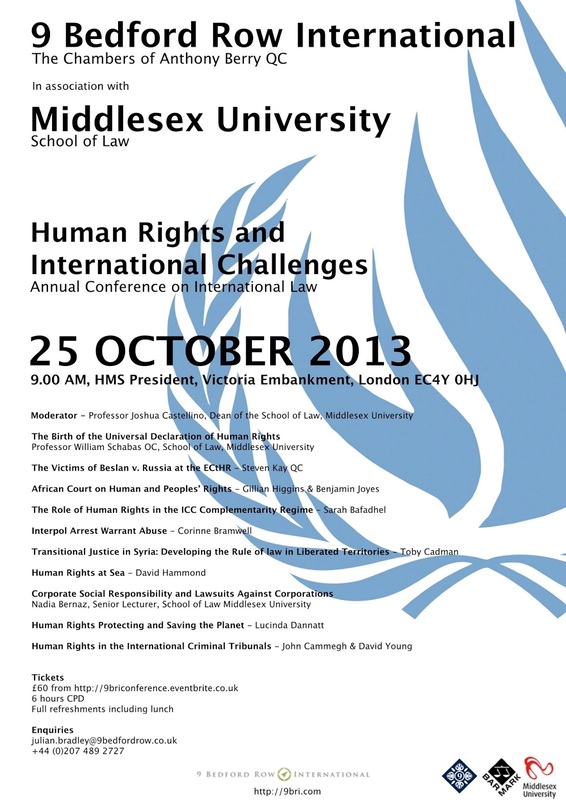 Recent years have seen a growing number of discussions about the role of the European Court of Human Rights (ECtHR). Some critics have accused the ECtHR of engaging in judicial activism, using its own notion of evolutionary interpretation to gradually expand the scope of the Convention. Others have argued that by doing so the ECtHR only fulfils its task of providing an up-to-date human rights protection in an increasingly integrated Europe. These debates are in part fuelled by normative differences in the perceived role of the ECtHR in the protection of human rights in Europe. Whether the ECtHR should play a limited constitutional role or not is therefore hardly only a legal matter. It is also a political one, which will have significant implications for European citizens and national democracy, as well as for the very idea of European integration by law. This conference addresses the question of what the role of the ECtHR should – and could – be in the contemporary and future protection of human rights in Europe. It brings together a distinct group distinguished European judges and renowned scholars from the field of human rights to debate these questions and suggest ways forward for the ECtHR. William Schabas,'The Contribution of the Eichmann Trial to International Law', (2013) 26 Leiden Journal of International Law 667-699.